Hot Chicken Breast Dinner & Auction: Saturday, November 17, 2018 at 6:00 p.m., Holy Innocents Anglican Church, 297 Paradise Road, Paradise is having a hot chicken breast dinner and auction featuring singer song-writer Paul Pearcey. Tickets are $15.00 per person. Contact Ruth at 782-1564 or the church office at 782-3071 for tickets. Paradise Food Bank and Coats for Kids and Adults. Admission: item or cash donation. Host: Holy Innocents’ Anglican Church, Paradise 297 Paradise Road, Paradise. The Paradise Adventure 50 Plus Club will be holding a Fall Fundraiser Variety Concert on November 16 at 7:00 p.m. in the Paradise Community Center Resource Room A. It will be a great evening of music, fun, laughter, door prizes and 50/50. Entertainment by Marie Parsons and friends. Tickets $10. Contact Gladys Hunt 7811594 or Doris Gosse 240-0560.
pm. There are 121 appointments to fill. Paradise residents are asked to book their appointments today by downloading the GiveBlood app or visit blood.ca. St. John the Evangelist Church, 20 Rectory Rd., Topsail, CBS will be holding their annual Fall Fair Card Game on Saturday, Nov 17 at 8 pm. Cost $5.00 Please bring your own cards and baskets. Topsail United Church Men’s Club Annual Breakfast with Santa will be held on Saturday Dec. 8 from 8 until 11 A.M., Usual Great Menu. Cost $ 8 Adults, Children $ 4, Face Painting, Coloring, Pictures with Santa, All are welcome. Tai Chi by the Sea holds two month (two days a week) introductory classes twice yearly. Our fall classes will begin September 10th (9:30 a.m.) at Topsail United Church. Cost is $40. Visit our website at taichibytheseanl.blogspot.ca for details. The Music Box Presents “A Baccalieu Christmas” concert, with special guests on Saturday, Dec. 8th @ 7:00 p.m. at Topsail United Church. Tickets are available by calling the Church Office at 8344567 or at the Door. Admission $12 Adults, Children $5. Food donations greatly appreciated for the CBS/Paradise Food Bank. Branch 50 of the RCL will be holding a concert on Friday, November 16th to help raise funds to support veterans. The concert will feature the choir from Musically Inclined, under the direction of Keri Kao, and young persons from the musical theatre group. Tickets at the door at $10.00 per person. Come and join the members of Branch 50 and have a time. All Saints Parish, Foxtrap Gospel Hymn Sing on November 25th starting at 7pm, downstairs in the Parish Hall. Our invited musician will be Faye Wheaton and our house band, Saints Alive. Come along and bring a friend for an evening of fellowship and song. Free Will offering at the door. For more information, Sandra 240-2114. Registration for Toy Hampers will take place at the Salvation Army Program House (at the entrance of the church property) on Nov 14 – 16, 2018. Time: 9:00am to 12:00 noon, 1:00pm to 4:30 pm. Applications received in person only. You will need ID with proof of address, MCP cards for everyone in household; documentation of all sources of income and documentation proving shared custody of children. If any questions call the church office at 834-6396. The Catholic Womens League of St. Thomas of Villanova will be having Guest Speaker Paulette Kane from Waterford Hospital to speak on Mental Health on Monday, November 19 at 7:00 P.M. at St. Thomas of Villanova Parish Hall. Everybody is welcome to attend. All Saints Parish Foxtrap are having a Luncheon and Card Game on Thursday, November 29th, starting at 12:30pm downstairs in the Parish Hall. A cold plate will be served, along with dessert, tea, & coffee; card game to follow. Cost will be $15.00 single. Tickets can be obtained at the door. For more information call Sandra 240-2114. Coastal Sounds Choir Association (CSCA) presents its 11th Annual Holiday Concert, featuring performances by Aurora Women’s Choir, Coastal Sounds Community Choir and a presentation of the 6th Annual Christmas Cantata Project with massed choir and orchestra. With special guests from the Association for New Canadians. Saturday, December 15, 7pm at St. James United Church, St. John’s. Tickets $20 regular, $18 student/senior, children 12 and under free. Get yours from a choir member, online at www. coastalsounds.ca, visit us on Facebook or leave a message at 709770-6927. Donations for Bridges to Hope Food Aid Centre appreciated. Please note all CSCA events are scent-free environments. Line Dance at the CBS Legion. Beginners on Monday’s at 7:00pm. Intermediate Tuesday’s at 7:00 pm. Advanced Tuesday’s at 8:15 pm. Chase the Ace at St. Thomas of Villa Nova Parish, Manuels, CBS on Sundays from 5:30-7:00 p.m. Draw at 7:15 p.m. Tickets are 3 for $5.00, 50/50 tickets are $1 each. Jackpot is $1,500. Royal Canadian Legion Kelligrews Open Mic Nights on second Friday of every month. Doors open at 6:30, starting at 7:30. For more info, call the Legion at 834-2331. Kiwanis Club, Kelligrews weekly card game. Every Wednesday 8:30 p.m. Doors open at 7 p.m. Come and enjoy the music and friends. Spousal Grief and Bereavement Support Group – Are you experiencing grief due to the death of your spouse? Please join us on Tuesday nights, 7:00-8:30 p.m. at St. Peter’s Parish Hall, Upper Gullies. This support group provides an opportunity for individuals to meet and discuss the loss of your spouse, provide support to each other, and share information that may help during the grieving process. This support group is “drop in” and supported by Grief and Bereavement Services, Eastern Health. For more information please call 631-9539 or 777-8972. The Holyrood Volunteer Fire Department is having Chase the Ace on Friday nights from 7-9 p.m. with the draw at 9:20 p.m. at the Royal Canadian Legion Branch 64 Holyrood. The Royal Canadian Legion is hosting a 50/50 draw at the same time each week. MGA 50+ Merchandise Bingo will take place on November 18 at the Holyrood Community Center at 2:00 p.m. Good prizes. Everyone welcome. The Conception Harbour open mic show is held on the third Sunday of each month at the Parish Hall next to the Jamie Murphy Memorial. Doors open at 1:00 p.m., the music starts at 2:00 p.m. Join the other performers or just tap your feet to that great old country beat. The Launch of The Salvation Army Christmas Kettles will take place on Saturday, November 17th at Dominion Store, at 10:00am. Volunteers will be need for shifts, beginning November 21st to December 15th (10:00 am to 8:00 pm) weekly, and also December 17th to 22nd (Monday to Saturday, our final day). Kettles will be placed at Dominion, Sobey’s, Liquor Store at Sobey’s and Piper’s in Kelligrews. If you can help, please call Ted Snook at 693-0213 or email at snookte@hotmail.com. Thank you for your help. Dance Party at The Tea Garden, Holyrood on Saturday, Nov. 17th at 8:00 pm. Rock & Roll to Live Music from the 50’s, 60’s & 70’s. Jive, Twist & Limbo contest, dress the way you did back then. Fun food provided (burgers, fries etc.). Tickets $20.00, available at the parish office 229-6250; The Tea Garden 229-7376, or Cecil Lucas 229-7570. Cash Bar. Net Proceeds go to Holy Cross Parking Improvement Project. Royal Canadian Legion Branch #62 invites all in the St Mary’s Bay region to Bells of Peace Ceremony at St. Mary’s Church at 4:30 pm on Sunday, November 11. Commemorate the 100th anniversary of the end of WW1 with a country wide remembrance bells of peace ceremony. Royal Canadian Legion Branch #62 Riverhead, S.M.B Sunday, November 11th Parade starts at 10:30 am at branch. March to cenotaph followed by wreath laying and service at church. Back to branch for soup/sandwiches/tea/coffee. Any organizations wishing to parade please be there to form before 10:30 a.m. We invite any Veterans wishing to march as well to form by 10:30. We invite anyone from Portugal Cove South to North Harbour to attend. Anyone wishing to lay wreaths please call 525-2712 to leave names of who the wreath is for and who will be laying the wreath. The Gospel Folk Seniors Choir invites you to come and enjoy “A Hallelujah Christmas” at St. Mary’s Anglican Church, Craigmillar Avenue, on Sunday, December 9 at 2:30 p.m. Special artists are Darrin Martin, Jenny Mallard, Katelyn Mayo and our new Choir Conductor, Yu Hang Tan. Complimentary tickets are available from Gospel Folk Choir members, Church offices or by calling 739-8714. 728-0808 or 728-1534. Affected by a loved one’s drug addiction? Call Nar-Anon at 770-5213, or e-mail naranonstjohns@gmail.com. 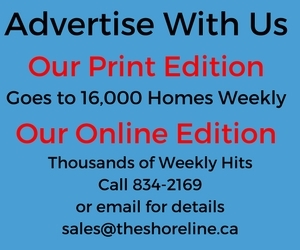 Meetings every Monday at 8 p.m. at the Church of the Good Shepherd in Mount Pearl, and on Thursdays at 8 p.m. at St. Theresa’s Church, Mundy Pond. Anonymity respected. The Canadian Cancer Society holds a general cancer support group meeting on the second Sunday of each month from 1:30 p.m. – 3:30 p.m. For more information contact Joan at 364-8716. The Rug Hooking Guild NL is looking to register your antique hand hooked mats. For more information please go to rhgnl.ca or call Winnie at 709-699-1502.